Q. 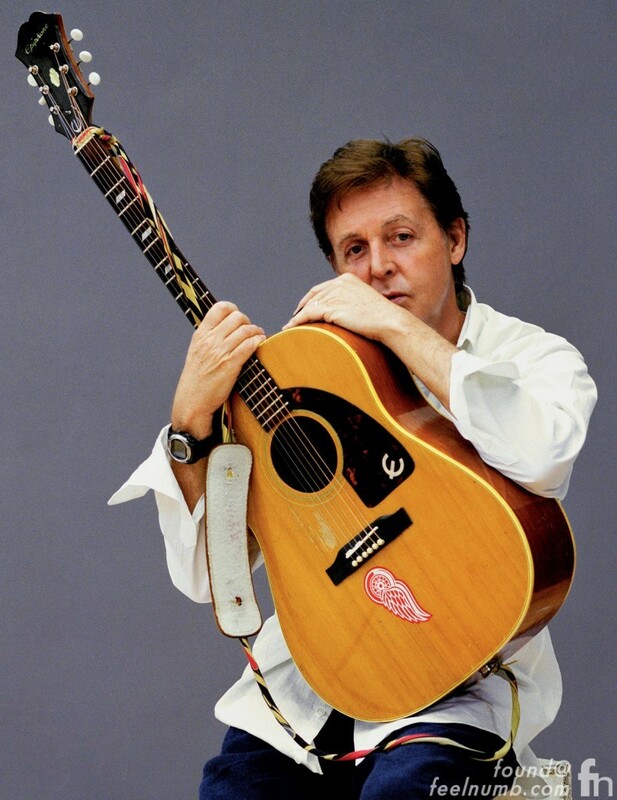 Why Does Paul McCartney have a Detroit Red Wings sticker on his 1964 Epiphone Texan Acoustic Guitar??? 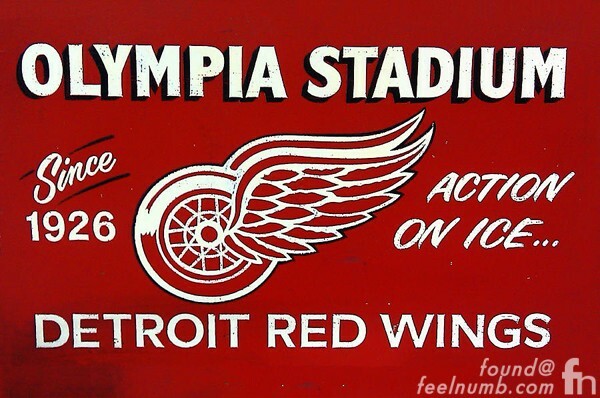 As the story goes, the sticker was given to McCartney by an employee of Olympia Stadium named Mike Kudzia (SEE COMMENTS BELOW STORY) on May 7, 1976 during the first night of two “Wings Over America Tour” concerts in Detroit, Michigan. The wing logo actually makes a lot of sense for the simple fact his band was named Wings!!! 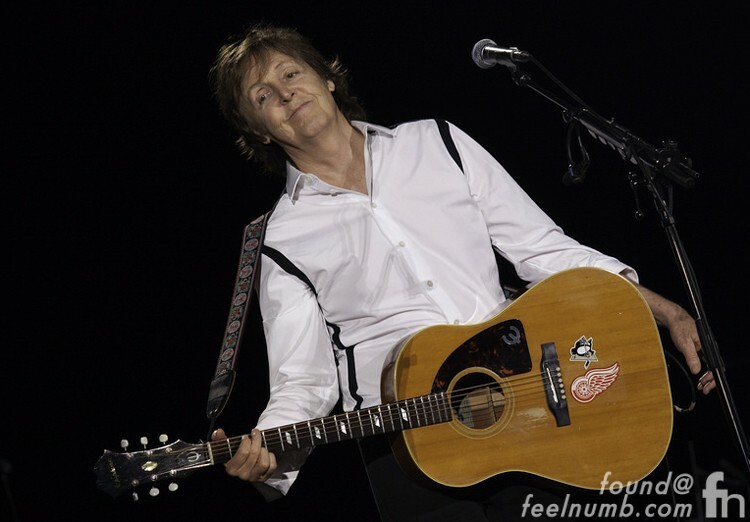 The “Red Wings Guitar” is the actual guitar that McCartney used in recording The Beatles “Yesterday“ and the same guitar he played when he sang “Yesterday” on the Ed Sullivan Show. Here’s a photo of Paul playing the “Red Wings Guitar” on the Sullivan Show 11 years before the sticker. 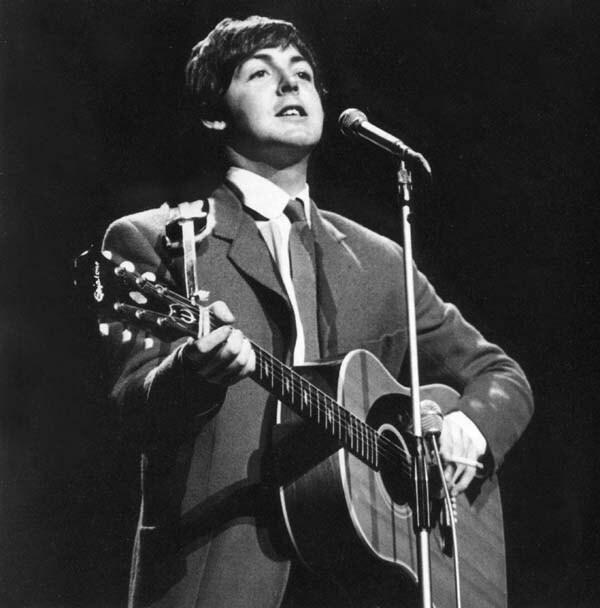 Coincidently, McCartney’s original guitar was made in the Gibson factory in Kalamazoo, Michigan. The right-handed guitar model Epiphone Texan FT-79 (N for natural finish) with the serial #194959 left the Gibson factory on May 23, 1964 and was bought by McCartney in New York in sometime in 1965. List price at the time was only $175.00 as it was considered a low-end model when he purchased it. 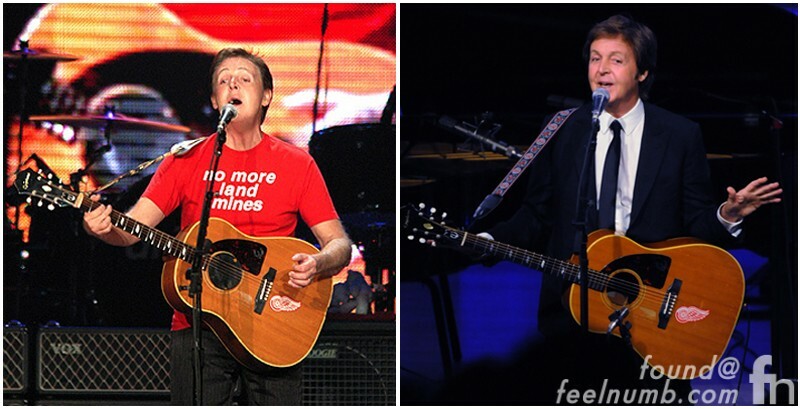 It was a great long-term investment because McCartney almost always plays this guitar when he performs “Yesterday”. 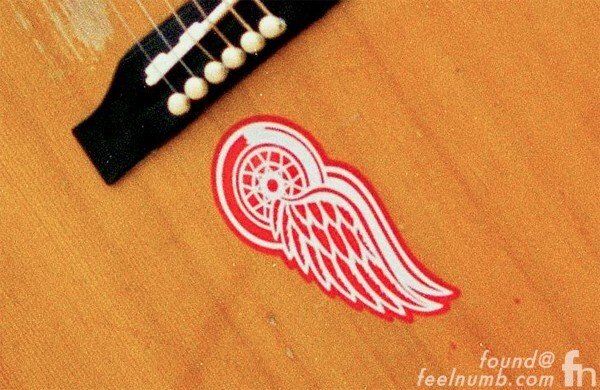 UPDATE: In August of 2010, McCartney (under a bit of pressure) added the sticker of another NHL Hockey team to the guitar. To find out why he added the Pittsburgh Penguins sticker to the legendary guitar, click the photo or link below. maybe Linda was… and he earned……….. Cool bass, but the stock strings were crap. It would be worth adding the price of the LaBella flats made expressly for this bass so it would play and sound like it’s supposed to. Paul was given the sticker at The concert in 1976. I was at that show. The Wings Over America Show. What a great show it was.